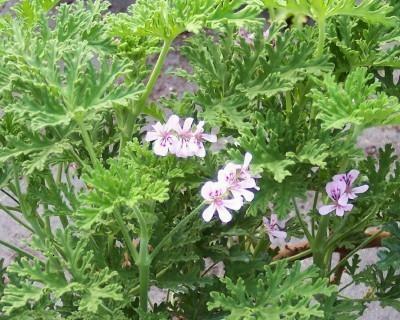 Old Fashion Rose Scented Geranium (p. graveolens) - Popular Scented geranium variety. Deeply cut green leaves have a strong rose scent. Popular for culinary use. Small pale pink flowers when in bloom. Lovely container plant and like other scented geraniums, can easily be overwintered indoors in colder climates if placed near a sunny window. Perennial zones 10-11+ Live starter plant in 3 inch container.